Articular cartilage is a viscoelastic tissue with loading rate dependent mechanical properties. Traditional mechanical testing methods tend to neglect higher frequency loading rates. They instead focus on static or quasi-static loading such as creep or low frequency oscillation. 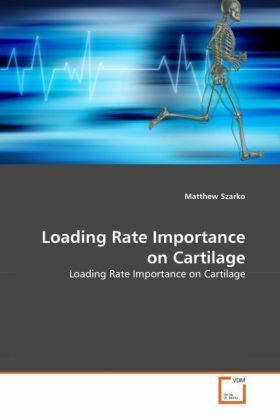 This book discusses a unique loading protocol that uses dynamic, low magnitude, high frequency loading as a non- destructive method for investigating these previously unidentified mechanical properties. This method was used in three cases to identify how various conditions affecting the extracellular matrix may alter the tissue's mechanical properties: enzymatic simulation of osteoarthritis, cryopreservation, and varying sodium concentration. In each experimental condition, the identification of differing mechanical responses between higher and lower loading rates indicates a necessity to include low magnitude, higher frequency loading to ensure a comprehensive investigation of load rate responses within viscoelastic tissues.